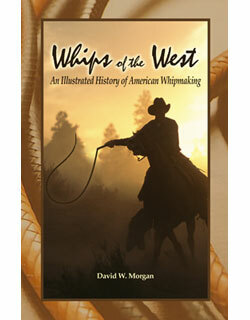 This profusely illustrated book by D.W. Morgan is a comprehensive introduction to whips. 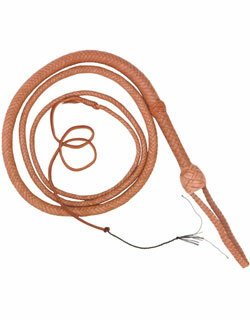 It extends the treatment of dynamics and design discussed in the first edition and illustrates examples of many more styles of whips. Two major sections have been added, the development and distribution of the Mongol whip, and a comprehensive review of the whips used in the Indiana Jones movies, including the resurgence of interest in whip cracking inspired by these movies. Paperback. 219 pp. Sales of books are final. No returns or exchanges allowed. 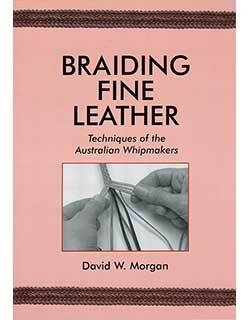 David W. Morgan, author of Whips and Whipmaking, Braiding Fine Leather, and Whips of the West, became interested in the subject of whips and leathercraft during a trip to Australia in the early 1960s. At that time whipmaking was an active trade there and he was able to meet a number of whip makers such as Burt Hill, Tom Hill, and W. Millowick, studying their craft in person and later through correspondence. On returning to the U.S. he and his wife Dorothy began Austral Enterprises, importing braided leather goods from Australia. The name of the company was changed to David Morgan to reflect the broader range of items offered as the business grew, but kangaroo hide whips were still featured. In 1976 the US government banned the importation of kangaroo so David turned to supplying the demand for whips in the US by making his own in calf skin. By the time the ban was lifted there were far fewer whipmakers active and he thought to write the book Whips and Whipmaking to better document the craft. In 1981 the first Indiana Jones movie was released featuring one of David's whips, and that movie, with the others following in the series, along with the readier dissemination of information over the internet, have helped fuel a resurgance in whip making. Throughout his study and practice at whipmaking David has shared his knowledge generously by letter, telephone and in person as well as by writing the three books to date on the topic, enabled by others who likewise shared their knowledge and many examples of leather craft from all around the world. For more information about David W. Morgan please visit David W. Morgan. For behind-the-scene peeks at our company, please visit Our Blog.